When the Devils started Steven Santini over Ben Lovejoy on Saturday, it was in hopes that the young defenseman could help suppress some of the Philadelphia Flyers’ offense after a 5-goal effort from the Colorado Avalanche on Thursday night. Not only did the Flyers win 5-2 today, but the Santini experiment barely even got off the ground. On just his second shift of the night, Santini took a puck up high and was forced to leave the ice. He did not return. In speaking to head coach John Hynes after the game, beat writer Amanda Stein reports that Santini suffered a broken jaw. He will be out indefinitely. This is an unlucky blow for both the player and team. Santini was making his first appearance of the season for the Devils and hoping to stick in the top six this time around. The 23-year-old defenseman played in 38 and 36 games respectively in his first two pro seasons, but has yet to even play half an NHL season, nevertheless establish himself as a starter. A second-round pick in 2013, Santini was a mainstay of the U.S. Juniors program and a standout defender at Boston College for three years. Santini is a stay-at-home type and does not bring much in the way of offensive potential, but is a smart, safe option on the back end and seemingly has the skill set and demeanor of a solid bottom-pair defenseman. While that may not sound all that exciting, Santini is the exact type of player that the Devils could use right now. After a hot 4-0 start to the season, New Jersey has allowed ten goals in back-to-back losses and have the Nashville Predators, Florida Panthers, and Tampa Bay Lightning on the docket this week. With a less-than-stellar goalie tandem of Keith Kinkaid and Eddie Lack and a defensive corps that is top-heavy with offensive-minded puck movers like Sami Vatanen, Damon Severson, Will Butcher, and Mirco Mueller. The team could use more conservative, tight defensive play right now and hoped Santini could provide it. Instead, the onus could be back on banged-up Lovejoy to pick up the slack in the defensive end. Another team eyeing overseas talent this off-season is one whose off-season has yet to begin. Russian news source Sport-Express reports that SKA St. Petersburg defenseman Yegor Yakovlev is planning to sign with the New Jersey Devils. It seems that GM Ray Shero and company have stayed busy on the talent acquisition front for next season, despite the team still being focused on their first-round playoff series. Yakovlev, 26, is yet another talented member of KHL powerhouse SKA. Teammates like Ilya Kovalchuk, Nikita Gusev, Sergei Plotnikov, and Mikko Koskinen are among many on the roster who could sign in the NHL this summer, but Yakovlev seems to be closest to a concrete deal. Yakovlev lost games due to injury in 2017-18, but last season set career highs with 21 points and a +30 rating in 56 games. He made up for some missed time this year with a strong showing for Russia at the Olympics as well, skating on the team’s top pair. A high-energy two-way defenseman, Yakovlev certainly appears to have the talent to push for a regular role in the NHL. Where exactly he fits in New Jersey is a different question. The Devils surprised many this season by earning a playoff berth just one season after finishing near the bottom of the league. Part of that turnaround has been the improved play on the blue line, greatly aided by the additions of Sami Vatanen and Will Butcher. On the left side, where Yakovlev plays, New Jersey has Butcher, captain Andy Greene, and – for now – John Moore. While admittedly it’s not as strong as the right side of Vatanen, Damon Severson, Ben Lovejoy, and seventh-man Steve Santini, it’s still a solid group and a consistent one at that, with all three playing in 81 games this year. Even if Moore, an impending unrestricted free agent, was to leave the Devils, Mirco Mueller is a promising lefty in need of some play time. While healthy competition never hurts, it certainly seems like Yakovlev is signing on to a situation where he won’t be guaranteed a starting job without earning it. Originally published on August 8th, and updated as of September 15th. While the offseason has crawled along, name after name has been knocked off the list of restricted free agents as teams try to put together their roster for next season. With Monday’s signing of Barclay Goodrow by the San Jose Sharks, there are only 20 RFAs remaining unsigned for the 2017-18 season. Heading that list is still Leon Draisaitl and David Pastrnak, two young superstars looking for a long-term payday before they turn 22. Each of them scored at least 70 points last season and have established themselves in the top tier around the league. Past them there is still a ton of talent. Alexander Wennberg and Bo Horvat make up the next tier of RFAs, coming off 50+ point seasons and key building blocks for their respective teams down the middle. Both just 22-years old they’ll be important contracts for Columbus and Vancouver to deal with before training camp starts. After that, the list is dotted with several useful players who should have full-time roles this season along with some who are on the edge of the NHL still. Calgary leads the way with three remaining, while many teams have all their free agents locked up. Below is a list of the remaining free agents, along with their point totals from last year. While many saw last season as a breakout for Severson, after Adam Larsson’s departure put more of the spotlight on him in New Jersey, he’s been playing at an extremely high level since he entered the league in 2014. 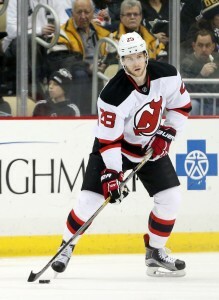 Now 23, Severson has recorded 69 points in 203 games while logging 20 minutes a night nearly every game for the Devils. He is the leader on their blueline, and will now be rewarded with a long term contract. The Devils of course moved Larsson to the Edmonton Oilers last summer in exchange for Taylor Hall, leaving Severson as the top right-handed option and powerplay quarterback on the team. His point total raised to 31 this season on the back of a big performance with the man advantage, but his defensive play is also up to snuff. Severson can at times look shaky in his own end, but generally drives possession with quick decisions. He doesn’t just clear the puck blindly, but moves it out with his feet or a quick first pass. Speaking of Larsson, the new contract is exactly the same as the six-year $25MM deal they gave him in 2015, though that had some trade protection and was actually buying out three years of free agency. Severson will give up just two UFA seasons, and could hit the market at 28. New Jersey, who’ve struggled the past five years to even ice a competitive team, have just a inked a shining star long-term that they can build around. The Devils are clearly still trying to compete for a playoff spot, but eventually they may need to do a slight tear-down and rebuild the team around young Nico Hischier, Mike McLeod, Pavel Zacha and others. Severson is now locked in as a top option on the blueline for some time. The $4.167MM cap hit is plenty affordable for the Devils, and carries incredible value. As Larsson demonstrated, puck-moving right-handed defensemen signed for less than $5MM are very rare to find. It’s very plausible that Severson even takes another step forward this season and starts to compete with players like Tyson Barrie and Torey Krug in that next tier of offensive production. If he can do that without sacrificing anything in his own end, the Devils will be quite pleased with his cap hit for years to come. Bob McKenzie of TSN reported the length and financial details. It turned into a solid summer for the Devils as they won the draft lottery and used that first-overall pick to select Hischier, a talented Swiss center, who put up 38 goals and 86 points in 57 games for the Halifax Mooseheads of the QMJHL. He is expected to break camp with the team and have an immediate impact. With recent injuries, Hischier could take over as the second-line center and start his career in a great position. The hope is he will help lead this team to the playoffs sooner rather than later. Butcher has been a more recent signing sensation as the Devils also won the offseason bidding for the Hobey Baker Award winner after he became a free agent several weeks ago. Butcher picked the Devils with the hopes of getting immediate playing time, since no one is truly sure if he is an NHL impact player. The 22-year-old blueliner put up outstanding numbers as a junior and senior at the University of Denver, but chose not to sign with the team that drafted him, the Colorado Avalanche. With the Devils biggest weakness being their defense, the team is thrilled to bring him on board. Zacha, the sixth overall pick in the 2015 draft, finished his first full season in New Jersey, playing in 70 games, while putting up eight goals and 16 assists for the year. While those numbers look disappointing, he didn’t play a lot of minutes last year (14:18) and didn’t play with much talent next to him, although he looked good playing alongside Taylor Hall at points during the season. He should take that next step this year. Kapla, like Butcher arrives to join the team’s defense from college. He played four years for the University of Massachusetts – Lowell and signed a two year deal immediately after ending his senior year. That first year consisted of five games. Already on year two of his deal, Kapla must prove he is an NHL defenseman this year. The group is not filled with impact players, so the Devils have little to worry about in the short term. They will likely rejoice once’s Clowe’s contract comes off the books. The veteran signed a five-year deal back in 2013 and only played two years, before being forced to retire due to concussion issues. Moore is an offensive defenseman (22 points in 63 games last year), but is totally inept on the defensive end. It wouldn’t be a surprise if the team went in a different direction on defense next year. Prout, who the team picked up at the trade deadline for veteran Kyle Quincey, only played 14 games for the Devils and it might take all season to determine whether or not he has value. Stafford, who just signed recently to a one-year deal, could easily be a bargaining chip at the trade deadline. After putting up 21 goals two seasons ago while with the Winnipeg Jets, his value dropped as he scored just eight goals between the Jets and the Boston Bruins last season. The Devils, however, are counting on a bounce-back season, which could eventually net them some more young talent. Noesen, who signed a one-year, two-way contract will try to make the roster this year after scoring six goals in 32 games for New Jersey last season. The team picked up some much-needed scoring in Johansson from the division rival Capitals for a second and a third round pick, but the 26-year-old winger scored 24 goals last year, albeit on a offensive juggernaut. The former first-round pick in 2009 has averaged 20 goals in the past three seasons and he should get even more ice time in New Jersey than he saw in Washington. The team has two years to see whether the forward is worth holding onto as a future piece or as future trade bait. The Devils have a much better knowledge on what Henrique can do. The 27-year-old center has had a 30-goal season (in the 2015-16 season) and has put up nice scoring numbers, but assists have been few, especially for a center. He had a down year last year, putting up 20 goals, but only had 20 assists to go with that. For a top-six center, those numbers are a little disappointing. The Devils still have two more years to see if he can develop, otherwise it’s more likely the two teams could part ways. As for Boyle, the Devils brought the 32-year-old in on a two-year deal to provide veteran leadership and a person who can center one of the bottom two lines and the team was praised for that signing. Lovejoy provides the team with a strong defensive presence, but like most of the defense, he is very one-sided. He is great on defense, but can’t produce much on offense, finishing last year with seven points in 82 games. At 33, this is likely his last contract with the Devils. Kinkaid returns as a quality backup to Schneider and should provide good value for the next two years. Two players heading in opposite directions of their career, but both are valuable to the franchise. Hall, despite coming off a down year (almost all Devils had down years), has two 25-goal seasons to his resume and still had 20 goals last year. The 25-year-old wing is one of the team’s top scorers and many believe that the team’s success will ride on his play. With three years left on his deal, the Devils again have time to decide whether he is worth a big payday down the road. Greene, a 34-year-old aging defenseman, is also a defensive-first player and has always been. As the team focuses its future attention on their defense, Greene playing time may drop over the next few years. Schneider is locked up for the longest on this team and until last year, that deal looked like a great one. The 31-year-old goaltender has been golden throughout most of his career, but the team’s poor defensive play finally got to Schneider, who struggled in his 60 games played. His 2.82 GAA and .908 save percentages were career lows and the team believes he will bounce back even though the team has done very little to improve their defense this offseason. To make matters worse, the team also lost Zajac to injury this offseason. The veteran center will be out for four to six months after he had surgery to repair a torn pectoral muscle, which he sustained during offseason training. While he may be back late in the season, the injury will force others like Henrique to step up and take a larger role this season. Zajac, who has spent his entire career in New Jersey, had 14 goals and 31 assists last year. But the fact that he’ll be 36 when is contract ends, this contract is likely to be one they want to get out of at some point in the future. Palmieri, like Hall, is the present day future of the Devils. The 26-year-old wing has scored 56 goals in the past two seasons and has been one of their most dominant players. At $4.65MM, that’s pretty good value for the forward. The Devils look to be in a better situation after a solid offseason. Striking the lottery and getting Hischier is a huge stroke of luck, one the organization needs after several years of struggles. The team’s defense also got a boost recently when they signed Butcher from the college ranks. Both prospects should provide long-term value, and the team is not clogged up with too many expensive contracts. Most general managers would be happy to pay Schneider just $6MM over the next five years. What the team needs to do is continue to improve and develop their prospects. Players like Pamieri, Hall, Henrique and Severson must continue to improve and take their games up a notch this season. But with a low cap number and some young prospects on the horizon, the Devils should continue to improve over the next few years. Poll: Which Restricted Free Agents Will Miss The Start Of The Season? After Toronto Maple Leafs’ forward Connor Brown signed this weekend, the count is now fourteen on remaining restricted free agents still to sign. David Pastrnak, Alexander Wennberg and Bo Horvat lead the group, while Damon Severson, Sam Bennett and Andreas Athanasiou all represent important players on their clubs. While most of these fourteen will surely sign within the next few weeks and be ready for the start of the season, there are often a few that take a little longer to sign. Last year we saw Rickard Rakell, Hampus Lindholm and Jacob Trouba all sign contracts after the regular season had begun. Though Rakell was injured and wouldn’t return until the beginning of November anyway, the other two missed important game action that could have cost their teams in the standings. With the end of August upon us, there could be more examples of RFAs holding out into the season. Below we’re asking you to vote on who you think will be left without a contract come the beginning of the year. Every RFA that has yet to be officially signed by his team is listed. You can vote for as many as you want, and make sure to leave how many games you think they’ll each miss in the comments. The hockey world has been swirling around David Pastrnak for the past few days, as negotiations with the Boston Bruins drag on late into the summer. Fans of the team are beginning to get nervous that there might be something standing in the way of a long-term deal, even while the Bruins’ front office assures everyone that they won’t be moving on from their young star. It’s not just Pastrnak though, as this summer seems to have a disproportional amount of high-level restricted free agents still unsigned into the middle of August. Leon Draisaitl, Alexander Wennberg, Bo Horvat, Connor Brown, Damon Severson and Andreas Athanasiou and many more are waiting for their next contracts and inching closer and closer to missing some of training camp. Sean Monahan signs on August 19th. Seven years, $44.6MM. Cody Ceci signs on August 23rd. Two years, $5.6MM. Ryan Strome signs on September 20th. Two years, $5.0MM. Johnny Gaudreau signs on October 10th. Six years, $40.5MM. Nikita Kucherov signs on October 11th. Three years, $14.3MM. Rasmus Ristolainen signs on October 11th. Six years, $32.4MM. Jonathan Bernier signs on August 2nd. Two years, $8.3MM. Brock Nelson signs on September 16th. Three years, $7.5MM. P.K. Subban signs on August 2nd. Eight years, $72MM. Tyson Barrie signs on September 7th. Two years, $5.2MM. Danny DeKeyser signs on September 20th. Two years, $4.4MM. Nino Niederreiter signs on September 20th. Three years, $8MM. Ryan Ellis signs on October 5th. Five years, $12.5MM. Jaden Schwartz signs on October 5th. Two years, $4.7MM. Ryan Johansen signs on October 6th. Three years, $12MM. Adam Henrique signs on August 27th. Six years, $24MM. Mikkel Boedker signs on September 7th. Two years, $5.1MM. Marcus Johansson signs on September 8th. Two years, $4MM. Nazem Kadri signs on September 10th. Two years, $5.8MM. Alex Pietrangelo signs on September 14th. Seven years, $45.5MM. Derek Stepan signs on September 26th. Two years, $6.2MM.